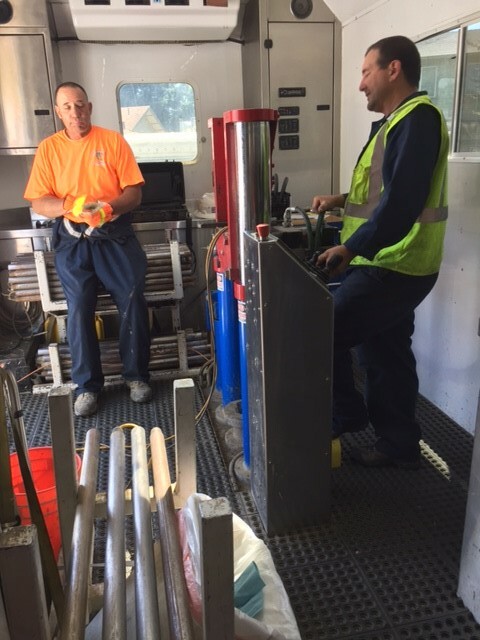 Gregg Drilling has created a High Resolution Site Characterization (HRSC) division to provide the most experienced personal and equipment in the industry to support our clients with their projects. Gregg has developed tooling to provide our customers with information needed to identify their soil type and provide an understanding of contaminant distribution and porosity in one direct push advancement. Gregg HRSC program provides 2 MIP Systems with XSD, PID and FID detectors and 2 UVOST systems. These tools can be used with Cone Penetration Testing (CPT) in multiple configurations to provide stratigraphic detailing along with contaminant profiling. 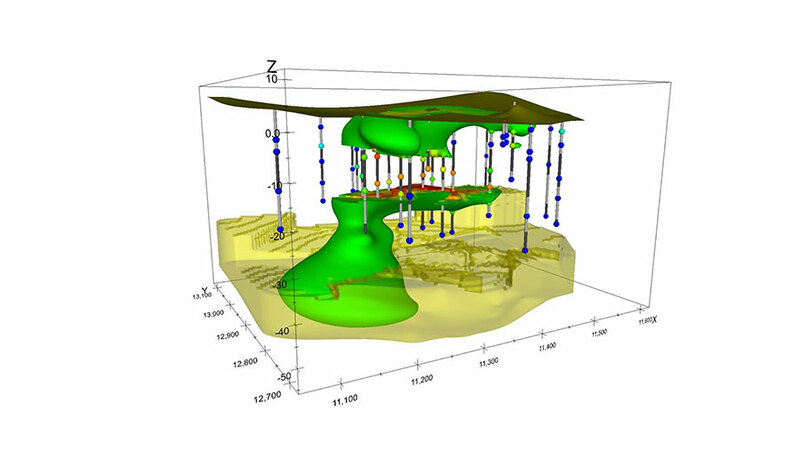 Gregg Drilling offers 3D modelling of the data collected from the above mentioned technologies. 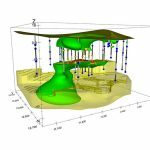 These models can be manipulated and viewed as cross-sections or 3D-models with video options for fly-throughs, reveals and more. For any questions on Gregg’s HRSC tools or 3D modeling, or to obtain a proposal or schedule work, please contact Frank Stolfi: fstolfi@greggdrilling.com or through the provided contact form. 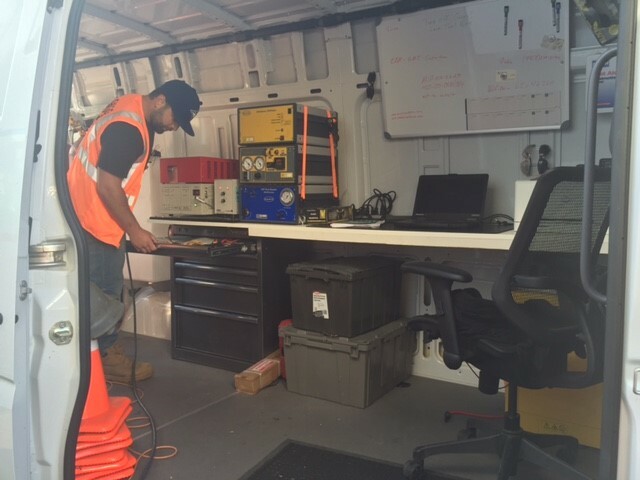 Gregg Drilling conducts Laser Induced Fluorescence (LIF) cone penetration tests using an Ultra-Violet Optical Screening Tool (UVOST) module that is located behind the standard piezocone, Figure UVOST. The UVOST works on the principle that polycyclic aromatic hydrocarbons (PAH’s), located in soil and/or groundwater fluoresce when irradiated by ultra violet light. Different types of PAHs will fluoresce at different wave lengths leaving a characteristic fluorescence signature. Measuring the intensity and wavelength of the fluoresced PAH allows one to assess the type and relative con- centration of PAH present in the CPT-UVOST sounding. 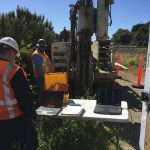 Performing CPT-UVOST soundings at multiple locations across a site allows for an accurate determination of the site stratigraphy and piezometric profile along with the location of the residual phase NAPL present at the site. 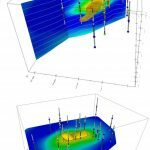 These data can be used to select appropriate boring, sampling and monitoring well lo- cations which allows for a more rapid, accurate and cost effective site assessment and remediation program when compared with the traditional multiphase drilling and sampling program. 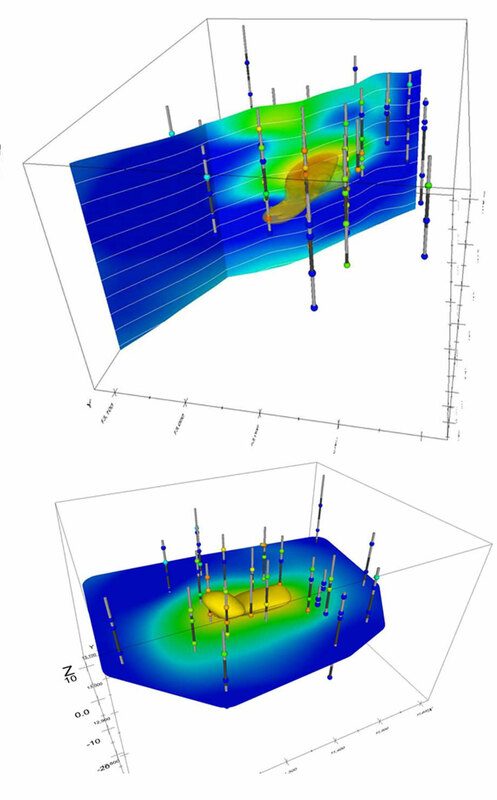 The UVOST (Ultra-Violet Optical Screening Tool) module in con-juction with Cone Penetration Testing (CPT) can provide detailed stratigraphic logging plus hydrocarbon contaminant screening. UV light from a laser is emitted through a window in the cone causing hydrocarbon molecules to fluoresce. Fiber optic cables transmit fluorescence to the surface where intensity and decay are recorded every 2 inches. Decay signatures determine the type of hydrocarbon contaminant and signal intensity determines the location. Minimal site and environmental impact. Capability to push up to 600 feet per day. Cost effective method to determine extent, location and type of contaminant. Color coded logs offer qualitative information and can be pro- duced in the field for real-time decision making. No samples or cuttings and significant time savings over traditional drilling and sampling. Gregg Drilling is pleased to announce that it has added a new tool to its suite of in-situ probes. 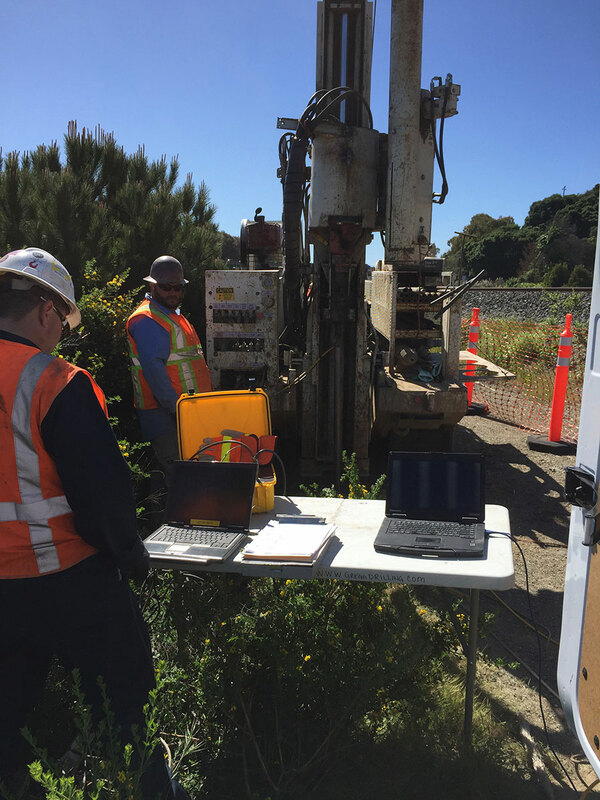 For years, Gregg Drilling has partnered with other providers to push the Membrane Interface Probe (MIP) in conjunction with the Cone Penetration Test (CPT). For the first time, Gregg Drilling will now offer MIP, making Gregg a one-stop shop for any contaminant screening. The new MiHPT detects volatile organic contaminants (MIP), measures soil electrical conductivity (EC) with a standard dipole array as well as incorporating the Hydraulic Profiling Tool (HPT) to measure injection pressure using the same down-hole transducer as the stand-alone HPT system. Using simple post-processing, you can estimate hydraulic conductivity (K) and water table elevation. As before, Gregg is able to use the MIP in conjunction with the CPT to gain additional soil stratigraphic logging data PLUS prepare a log of VOCs and formation permeability in one push. This is ideal for remediation investigations and great for determining contaminant mobility and migration pathways. Useful for detecting and logging both chlorinated and non-chlorinated VOC contaminants. Able to detect contaminants in both coarse and fine grained soils. Works in both saturated and unsaturated soils. The MIP can be either pushed or driven to depth. Standard tool configurations combine the MIP with other sensors for lithology or permeability logging. Real time contaminant screening information is generated, allowing field adjustment of the site investigation. The MIP is a direct push tool that produces continuous chemical and physical logs of the vadose and saturated zones. The system detects VOCs in-situ and shows where the contaminants occur relative to the geologic and hydrologic units. Vertical profiles, transects, 3D images and maps can all be produced from the electronic data generated by the MIP logs. The unique capability of providing reliable, real-time information allows for informed and timely decision making in the field. 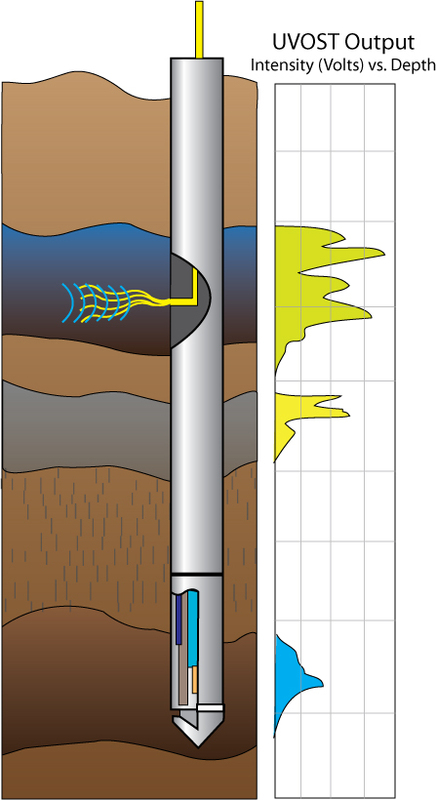 The MIP is a downhole tool that heats the soil and groundwater adjacent to the probe to 120 degrees Celsius. This increases volatility and the vapor phase diffuses across a membrane into a closed, inert gas loop that carries these vapors to a series of detectors housed at the surface. Continuous chemical logs or profiles are generated from each hole. Soil conductivity is also measured and these logs can be compared to chemical logs to better understand where the VOCs occur. The MIP technology is only appropriate for volatile organic compounds (VOCs). The gas stream can be analyzed with multiple detectors; for example an XSD detector is used to detect chlorinated solvents, a photo-ionization detector is used to detect petroleum hydrocarbons, and a flame ionization detector is used to detect methane. For more information, please download our datasheet. The HPT system is designed to evaluate the hydraulic behavior of unconsolidated materials. As the probe is pushed or hammered at 2cm/s, clean water is injected through a screen on the side of the HPT probe at a flow rate usually less than 300 mL/min. The injection pressure, which is monitored and plotted with depth, is an indication of the hydraulic properties of the soil. A relatively low pressure response indicates a relatively large grain size, and the ability to easily transmit water. However, a relatively high pressure response indicates a relatively small grain size, which correlates with the inability to transmit water. Additionally, an EC dipole is integrated into the HPT probe. This allows for the collection soil electrical conductivity (EC) data to interpret the lithology of the subsurface. In general, the higher the electrical conductivity value, the smaller the grain size, the lower the electrical conductivity value, the larger the grain size. However, other factors can affect EC, such as mineralogy and pore water chemistry (brines, extreme pH, contaminants). Conversely, the HPT pressure response is independent of these chemical and mineralogical factors. There are five primary components of the HPT system: the probe assembly, controller, pump, trunk line, and field instrument. The probe assembly consists of the section that houses the 100psi pressure transducer, water and electrical connections, and the probe body with the injection screen and electrical conductivity. Injecting water at a constant rate is integral to system operation. A controller box houses components that monitor and regulate the water injection rate and pressure, as well as pressure transducer signal conditioning electronics. The flow rate is set manually on the front of the controller, and a valve is used to turn on or shut off flow. A vane pump provides system pressure ensuring adequate flow to the screen. The pump is secured to a frame with an integrated visual flow meter. Water and power are transmitted from the controller to the probe assembly via the trunk line. The probe rods are pre-strung with the trunk line before advancement of the HPT probe begins.